First and goal is a great way to compete against your friends, with a Twist!! This classic game offers a new level of fun by returning your ball to your neighbor. It works like this, each person gets 3 Balls. Every time you make a shot your ball goes to your neighbors side. The goal is to empty your side first. The faster you throw the quicker you can pile your neighbor up with balls. The first one with no balls left on their side Wins! 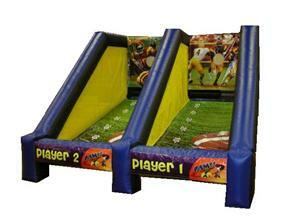 This game is perfect for School carnivals, graduation parties. Birthdays, or just some good old fashioned back yard fun.